At just 11-1/16" (W) x 4-1/4" (D) x 7" (H), no larger than a briefcase, MOBILE CUBE is a traveler’s dream. Battery-powered, it can be operated anywhere — just plug in, turn on, and jam. Two high-performance speakers provide stereo sound that defies MOBILE CUBE’s physical size. 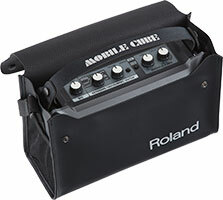 Equipped with Roland’s legendary FX engine, MOBILE CUBE offers high-quality stereo reverb and chorus effects. Sweeten your vocals, add fire to your guitar tone, or immerse your mixes in a rich stereo sound field. Center Cancel is also provided for minimizing vocals in pre-recorded music — great for karaoke and play-along performance. Thanks to its variety of inputs, MOBILE CUBE accommodates microphones, keyboards, acoustic guitars, electric guitars, MP3 players and more; no other instrument amplifier of this size has a stereo input port. Use it as a practice amp at home, while traveling, indoors or out. It’s great for parties, karaoke and vocal lessons. Connect it to a mic stand for use as a monitor speaker or micro PA.
Strong, water-resistant carrying bag for MOBILE CUBE. Speaker stand for CUBE amps, including the CM-110, CM-220, CM-30 and Mobile-CUBE.